Showing our appreciation for 30 years of support! however the application is accepted by first come, first served who have completed the application. Please be advised that it is not able to complete the application if it is fully booked. Participants (men and women) must be 18 years of age or older on the race day. (high school students is not allowed) who are able to finish the entire distance within 5 hours 30 minutes. 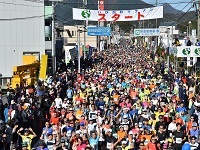 Participants (men and women) must be 15 years of age or older on the race day.(Jr. high school students is not allowed) who are able to finish the entire distance within 3 hours. November 10, 2018 (Saturday) 12:00 p.m. - 7:00 p.m.
November 11, 2018 (Sunday) 6:30 a.m. - 8:45 a.m.
For the competition, we have imposed the following type of time-limit points. For participants who are unable to pass or who are at a pace that will surely exceed the time limit, please discontinue immediately and board the sweep bus when so instructed by the race officials. 18 years of age or older (excluding high school students). Must be able to complete the race within 5 hours and 30 minutes. 15 years of age or older (excluding junior high school students). 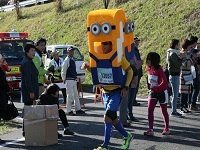 Must be able to complete the race within 3 hours. •T-shirt, Local special souvenir, Original picture book "Cheer Dog Taro". •Finisher's towel (only for participants who have completed the race within the time limit). *Certificate of completion will NOT be issued. •Men and women who finished from the first to tenth place. ■* Participants must consent to the following terms and conditions before signing up. (1) I confirm that I am free of heart disease and other illnesses. I am careful about my health and have trained sufficiently to take on the event. I understand that by participating in the event, I accept full responsibility for any injury, illness, accident, loss of belongings or other such incident that I may experience. (2) If I suffer an injury or an illness during the event, I will not object to receiving first-aid. I will also not question the right of the organizers to determine how the treatment will be conducted. (3) My family, relatives, guardians (if the participant is a minor) or team members (in the case of a team entry) have consented to my participation in the event. (4) I will bring my health insurance card (copy) when I participate. (5) I understand that the liability of the organizer with regard to compensation for any accidents, injuries, or illnesses that occur during the race is limited to the terms of the insurance that the organizer has taken out. (6) I hereby exempt the organizer from responsibility with regard to any accident, injury, illness, loss of belongings or other such incident that I may experience during the race and agree that I will not file any claims for compensation. (1) The marathon course is within a flood zone area. The event may be canceled in the event of flood restrictions, a rockslide, an earthquake, storm or flood damage, snowfall, criminal activity, an accident, a strike, terrorism or other circumstances beyond the organizer's control. 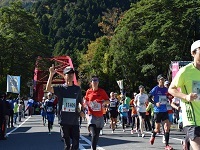 Even after the event has started, the organizer or facility manager reserve the right to shorten or cancel the marathon if they determine that it would be difficult to maintain the safety of the runners and the volunteers. (2) Entry fees will not be refunded under any circumstances, even if the event is shortened or cancelled in situations such as those listed above. (3) I understand that if the organizer determines that there is a hindrance to the event and consequently decides to stop the race, I will stop immediately and do as instructed. I also understand that should an accident, fire, or other emergency occur during the event, emergency vehicles will be given priority on the course. In such cases, I will follow the instructions of the police, firefighters, and event officials. (1) I will not make any false declarations regarding matters such as my age or gender, and I will not participate using another participant's bib number. If I am found to have violated these conditions, I will abide by the decision of the organizer with regard to matters such as whether I will be disqualified, stripped of any awards that I may have received, and banned from participating in future events. In addition, I acknowledge that the organizer is under no obligation to refund or provide aid to any applicant who makes a false declaration or participates using a bib number registered under another person's name. (2) Once your application has been submitted, you cannot change categories or cancel your entry due to personal reasons. In addition, any overpayment or duplicate payment of entry fees will not be refunded. (1) I hereby give my consent for event footage, photographs, articles, course times, and other materials (including those containing personal information such as my name, age, gender, course time, and image) to be used in media such as newspapers, TV programs, magazines, the Internet, and pamphlets. I also grant the organizer the rights to publish and otherwise use the above. (2) The applicant's personal information will be handled in accordance with the organizer's personal information protection policy, which is described separately. (1) The organizer bears no responsibility for any delays caused by matters such as the road conditions or public transportation issues on the day of the event. Recognizing the importance of personal information, the organizer strictly adheres to the Act on the Protection of Personal Information and all related laws and regulations and abides by its own personal information protection policy. To provide a better service to all event participants, the organizer will use this information for the following purposes: to notify participants of event details, course times, and other related information; to inform participants of future events and offer services from cooperating, partner, or related organizations; and to announce course times (rankings, etc.). The organizer or an authorized representative may also use such information to contact you to verify the content of your application. 1. The organizer shall not be responsible for any delay to your application caused by problems with postal or Internet services. 2. The online application form may not be compatible with all devices, operating systems, web browsers, etc. * Participants must consent to the following terms and conditions before signing up.